New research into In Vitro Fertilization success rates has revealed a curious trend: white ladies are more likely to successfully become pregnant as a result of the procedure than women of other ethnic backgrounds, and scientists say they can't figure out why. It's a white mystery, not unlike that confusing flavor of Air Head that made you realize that they all sort of taste the same when you don't have an artificial color to tell your brain what to think. Nottingham University researchers found that women of white European ancestry got pregnant after a single round of IVF 43.8% of the time. That's compared to 35% of women from other backgrounds. Overall, 48% of white women who attempted IVF got pregnant compared with 38% of East Asian women, and under a quarter of Middle Eastern and Afro-Caribbean women. Edwards believed that increased control over human reproduction could not only treat the infertile but also allow for socially favored characteristics to be selected and bred into the population. 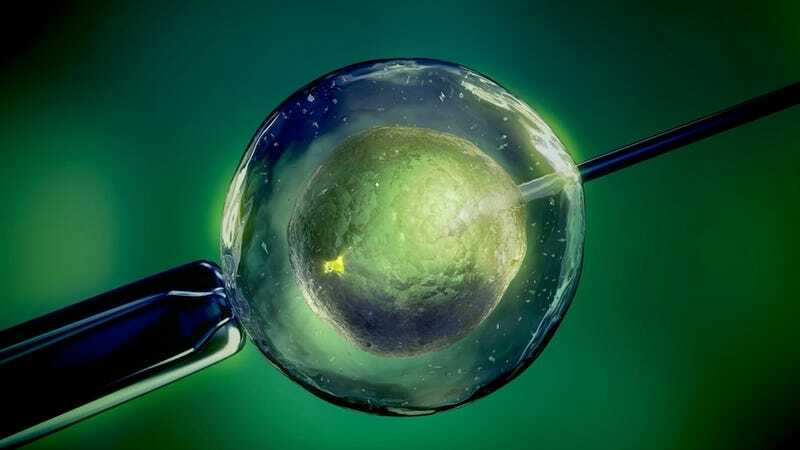 Edwards himself hinted at the link between IVF and eugenics when reflecting on the 25th anniversary of Louise Brown's birth in 1993, saying that developing IVF "was about more than infertility ... I wanted to find out exactly who was in charge, whether it was god himself or whether it was scientists in the laboratory." Edwards’s conclusion?—"It was us." Unsurprisingly, eugenics enthusiasts don't exactly have a reputation of being super excited about nonwhite people having lots of babies. Is it any wonder that a technology developed and championed by in part by eugenicists might not be totally awesome at helping women of color battle infertility? Despite the uncomfortable implication of the racial disparity in IVF success rates, the research's authors say they aren't sure how to account for the disparity. However, they're optimistic that this might give them insight into how women with different genetic backgrounds might require different approaches to fertility treatment. And that's better than a kick in the ovaries.